I was all set for my 30k run two Saturdays ago – went to bed early, got my kit ready, drove into the city all set for my run, and a quarter of the way round my foot started to hurt and a small blister had formed. I decided stupidly to push on and push through what at some points was excruciating pain and yes you’ve guessed it I made it worse. I decided to nip it in the bud and booked in with my podiatrist who put some padding and dressings in place rather than try and treat myself – 6/7 weeks to the marathon – I figured I didn’t have time to mess around. I went back to my running, a few niggles no dramas…. then I got to my long run again last Saturday and this time it was a 32k. What do you think happened…? 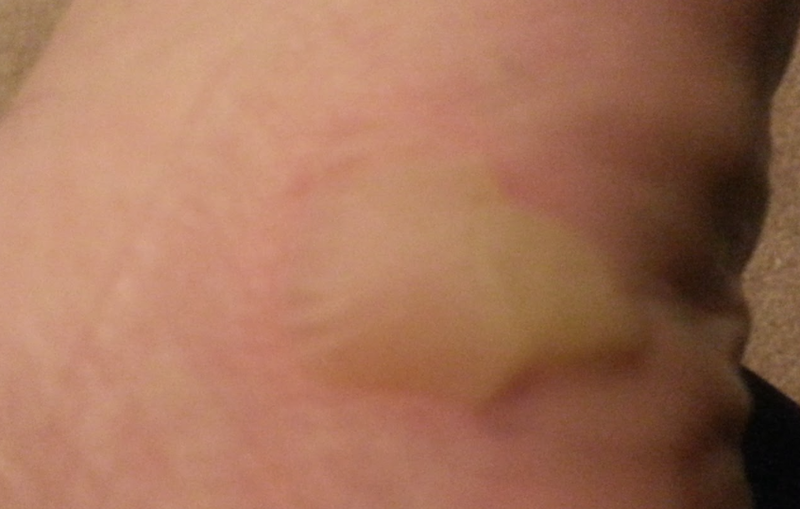 Yes You’ve guessed it the blister returned with a vengeance and this time it was a whopper. How I managed to run 32k on it I will never know but I got back home and was howling in pain and out of frustration. This was my blister at its largest – it was a monster – at least an inch and a half big! yuk. My friend who is a nurse came around a day or so later and popped the monster of a thing and dressed it. I was a bit of a baby – but I have to say it is getting better but I haven’t run in a few days and I am just accepting I need to rest it as there is some tissue damage underneath. Hoping that this weekend I will be able to get back into things but I wish sometimes I would take my own advice! But I am amazed that such a trivial thing as a blister can cause such a hassle and essentially sideline you from running! So don’t do what I did! Anyway ignoring what i did above here are some tips for what you potentially should do if you find you have a blister. Again remember these are just my thoughts and opinions – if you have a medical issue always seek professional advice. Many people swear by wearing two pairs of socks saying that the friction will be between the socks rather than the sock and the skin. My foot was rubbing against my shoe so in that instance that might not be the best option but it might help with an extra layer…..
My Podiatrist told me to put cornflour in the bottom of my shoes which will basically help absorb any excess moisture and ultimately help avoid blisters forming. Make sure that your footwear fits correctly. If your shoes are too big they will push your foot around and rub, if they are too small they will potentially present issues also so good shoes for your feet especially when running long distances are a must and will help avoid blisters. Again many posts by experts that I have read say to avoid cotton socks and to wear moisture wicking ones or those made of nylon. I have a wide range of socks and I haven’t always found this to prevent blisters but it does help. Rubbing Vaseline or equivalent onto the feet is also meant to be a great way to avoid blisters and there is also a blister spray that I was given a sample of at a running expo which my Podiatrist mentioned might help me also. You can buy these from any large chemist or I would imagine a specialist running store. I think I tried too late but if you feel a sore area on the foot when running you could always put a plaster such as Compeed on even though you don’t yet have a blister. I think I did it too late and my blister actually expanded but I already had a blister and it was a biiiiiiiig one! 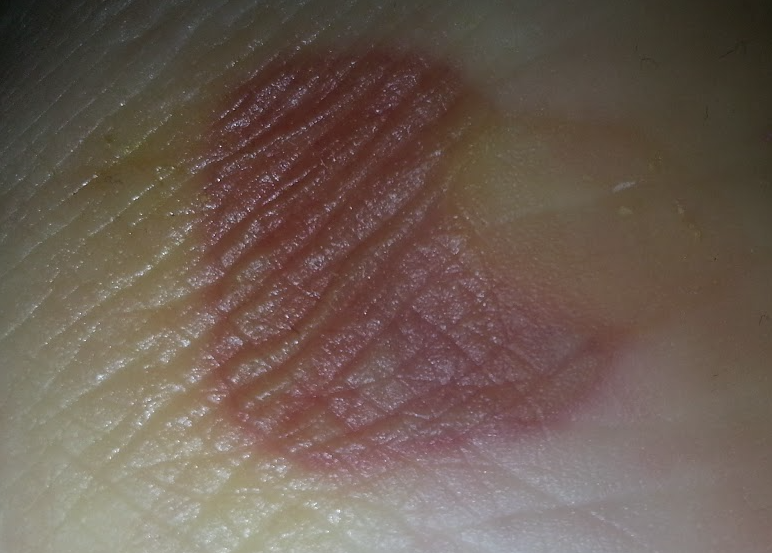 Here is my blister now after my friend popped it. There is a bit of tissue damage so I need to let it heal before running on it but it is much better. If you are in the unfortunate position of having a blister right now I found this great post which you might find useful – it’s from 2012 but it seems to be one of the most balanced articles I could find. Runners World are a good option too to have a look at. If you have a really bad blister then pop along to your podiatrist or local running store depending on the severity of your issue. In Brisbane we are lucky to have some specialist running stores that also have podiatrists attached to them such as InTraining. They weren’t who I went to but having a had a chat to one of their people this morning they do offer some great advice and I am considering going in to see them if this doesn’t improve! Ouch! Hope you heal quickly. I find snug fitting, moisture wicking socks like Feetures to be fantastic… haven’t had a blister since I made the change from cotton (Touch wood!) Might have to keep the corn flour tip in mind for when my km’s increase though! Thanks for the tips and good luck with the training. Hi Renee – thanks. I am hoping to be running again by the weekend – I never thought I’d be sidelined by a blister!! Hope you are back into training and going well. Not long now!! I am back into training yay!! Fighting a head cold this week though booo!… hoping it’s gone by the end of the week… Can’t afford to miss any training runs with only 6 weeks to go 🙂 Not long at all. Exciting. That’s great you are back training. Cold wise I usually knock back fresh garlic, honey and lemon in warm water – usually takes the edge off. Hope you feel better soon !! 6 week countdown! !